The goal of this project is to bring large-scale images of astronomical objects taken by professional and amateur astronomers to the public. 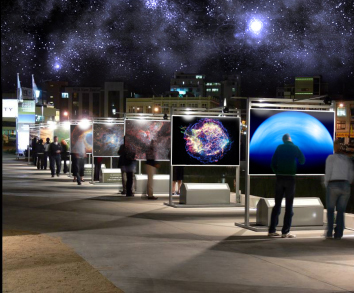 Instead of keeping these exhibitions inside of planetariums and science centers (though weâ€™ll be excited to have them there), we hope these images will make it into spaces like public parks and subway stations. Our hope for FETTU is that the general public will be engaged in the majesty and wonder of astronomy â€“ whether they consider themselves interested in science or not. How does FETTU happen? Well, the answer is largely from people who are committed to seeing it in their local community. We've put together a list of tasks that a local organizer would need to take on in order to have FETTU. We'll supply the digital files and captions and other information for free, but people on the ground must raise the money and be responsible for the physical installation and other details. You don't have to be an astronomer or a science educator in order to host FETTU. You just need to want it to happen and be willing to work to get it done. If you have questions, please contact us at the email addresses listed on the web site. We hope all of the IYA2009 activities are a big success, including FETTU. (PS For a very cool trailer that features FETTU, take a look here.